What’s in Lazy Man’s Wallet? Jeremy of GenXFinance suggested that a few of The Money Writers get together and share what’s in their wallet. I thought it was a terrific idea. It’s been three years since Mint interviewed me, and then they deleted the Flickr account with the picture of what was in my wallet. USAA Cards – I love USAA and their banking is top notch. It’s one of the great benefits of having a wife in the military. Included in here is a joint savings account with my wife, a business savings account, a personal savings account, and a fourth account that I honestly don’t know what it goes to. Marriott Rewards – Since we own a timeshare with Marriott it makes sense to maximize our reward points when we are staying at the Marriott. This is a joint card that both me and my wife have. Chase Rewards – This is my main credit card. Almost all my expenses go on this. It’s a grandfathered reward program that gives me 5% back on gas, groceries, and drug stores… and 1% everywhere else. Yes I know how lucky I am. AA Rewards – Similar to the Marriott Rewards… a joint reward card for a company that we tend to use a bit. Chase Business Rewards – This is my second most used credit card. It gives me 3% at restaurants, office stores (like Staples), and home improvement stores (Home Depot, Lowe’s). (Yes, I really know how lucky I am). Bank of America bank card – Simple ATM card for the bank account that I’ve had since I turned 16. Mensa Membership (Expired) – I joined Mensa back probably about 10 years ago. I was looking for something to prove that I was smart, since I didn’t have a lot of job experience. I got a lot of comments on it and I think it opened a couple of doors for me. Heath and Dental Insurance Cards – Both provided via my wife’s military career. Membership and Club Cards – Costco, BevMo (a local spirits store that has everything), and Safeway (local grocery chain) are here. Wish they had key chain versions, but they don’t seem to. Military and Driver’s License – Since the plan has always been to move back to Massachusetts at some point, I just kept my Massachusetts identification. That’s one of those military perks. Cash – One of the rare times that I have almost perfect change for any amount up to $100. Typically I carry between $35 and $100. 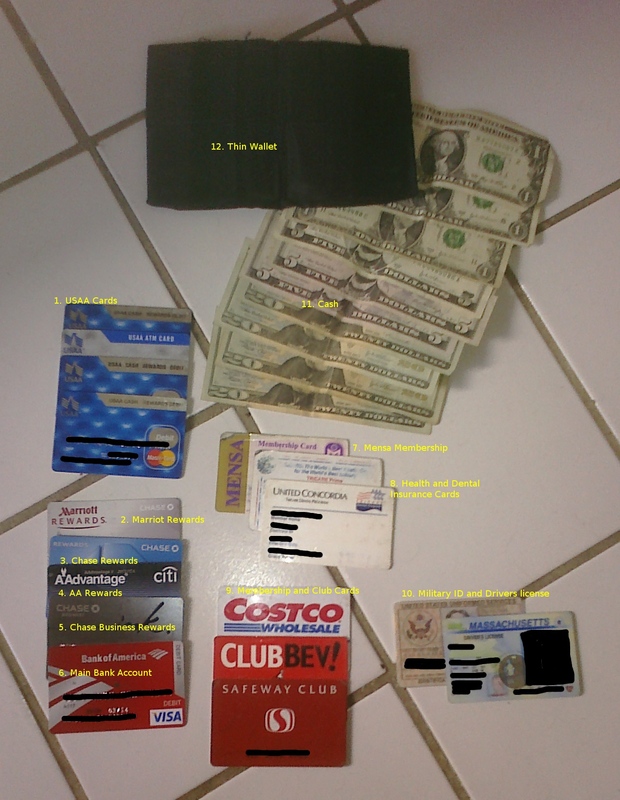 Thin Wallet – It is hard to tell in the picture, but this is an All-Ett. I particularly like it since it spreads the cards over more space rather than having them stacked. The Rip-Stop Nylon that they use is very durable and very thin. I can’t recommend these wallets enough. I’ve more about it in the past at: Thin Wallet: Avoid Back Pain. Jeremy from Generation X Finance show us what is in his wallet. Sun’s Financial Diary tells us what is in his wallet. Brip Blap shows you what’s in his wallet as well. I carry a Class “A” commercial driver license in my wallet; and if you’re unemployed – you should to. Don’t leave home without it. I do too, Matt! I’ts been 12 years since I’ve been behind the wheel of a semi but it seemed like a waste just to let the license lapse. A big difference between your wallet and mine … I have 8 pictures of my kids (2 kids). I have 80 pictures and 4 or 5 movies of my dog on my Palm Pre. I don’t see the need to take up physical space, when I have a pile of virtual space going unused. I go the dumb-phone route in favor of longer battery life (and less expenses), so photos that I’d store on my phone would be tiny. We do have roughly 2000 photos in our online album, though. I tend to have a recharged phone all the time. I’m always within a place with an outlet (or car adapter) in a two day span. I can’t go back to the dumb-phone, but maybe next week or later, I’ll post a deal on a less expensive (cheap plan) smart-phone. I’m forgetful when it comes to charging, so I know I’d constantly have a dead battery when I really needed it. I can remember to charge once every 4-5 days, though. I am lame. I did not get to participate as I was running around like a chicken without a head trying to get my Las Vegas trip up on my site. Wish I could have joined in the fun. My wife used to forget to charge her phone too. Turns out that the problem is that charging a phone doesn’t become a habit when it lasts 4-5 days. When it lasts one day, it becomes second nature to just come home and plug it in. So now her smartphone is more likely to be charged than her dumb one. man, i just realize how much crap people carry around with them. I mean, do you really need to carry everything all the time when you aren’t using them on a daily basis? the 4th usaa card is a maestro debit card, which is just a debit card. i have no idea why usaa issues you both a mastercard debit and a maestro debit. I can certainly cut down the credit cards in half. I could probably keep the Safeway, Bevmo, and Costco cards in my car. However, there are times when I might be at Safeway when a friend drives. Considering the thin wallet I have, it is not a big deal to carry extra. I also look at it from the perspective that carrying a lot of stuff in the wallet means that much more of a headache if I misplace, lose, or wallet gets stolen. With that said, for the first time ever, my credit card was declined last night. If I hadn’t been able to get a hold of customer service, I would have been SOL (although I did have a second cc and my worse half was with me with her cc). I did NOT know that some credit card issuers, perhaps most now, will put a block on your cc if you use it too many times within a short period of time and/or within a 24 hour period ( I was told 12-20) until you call in to verify your information so they know it is you burning up that card. This card is my staple card and I burn the heck out of it, so I was really surprised that yesterday somehow triggered the block. After a bit of contempt and anger, a phone call and verification, the card was released to be swiped and swiped again. it makes perfect sense after the fact, given that a nefarious person would want to charge as much as possible within a 24 hr period, since most people take that long to discover and report that they lost a card, so I get that and think it is a good policy. I just wish that I knew how many times I could swipe in succession or within a given period of time before hand, though. oh, I used the card 18 times within the 24 hr period, however, 8 of those were within an hour.